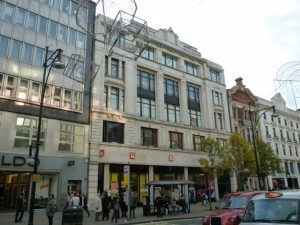 While in London last week, High Holborn (store #173) and Tottenham Court Road (#175) weren’t the only two ex-Woolworths I managed to work into my travels. 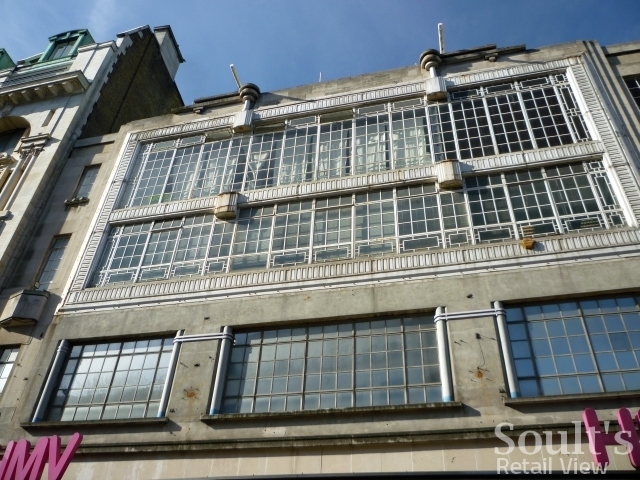 Back in November, you might recall that I photographed the former Woolworths flagship store (#161) at 311 Oxford Street, below, which opened in 1924 and was sold off in the early 1980s. 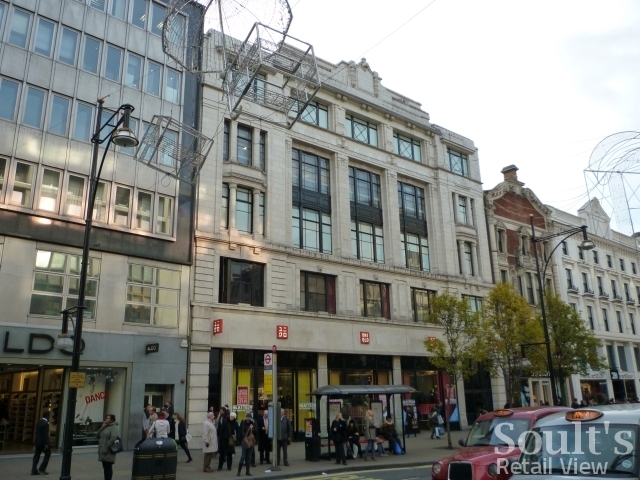 Since November 2007, the property has housed a 25,000 sq ft ‘global flagship store’ for the Japanese fashion retailer Uniqlo, but it’s had a succession of previous occupants since Woolies’ departure, including Burton, Tesco Metro and (fairly briefly, from 2004) Waterstone’s. 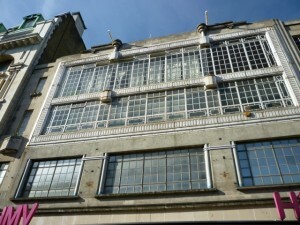 In my blog at the time, I made reference to Woolworths’ second Oxford Street store – #463 – which opened in 1932 and was sold off at the same time as its near-neighbour. At that point, however, I wasn’t clear where the store had been, or what it was now. 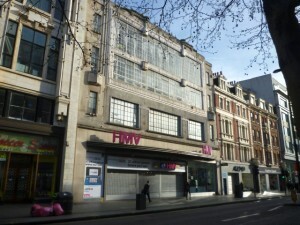 However, the ever-reliable John Rogers was able to fill in the details, pinpointing the location to 150 Oxford Street and the present-day HMV. So, being in central London, I took the opportunity to check it out. 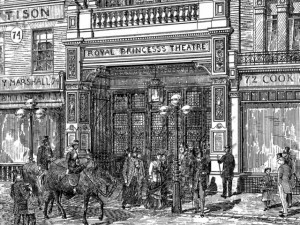 Situated towards the slightly less glamorous eastern end of Oxford Street, the building is nevertheless rather glorious, and was apparently purpose-built for Woolworths on the site of what had been the Royal Princess’s Theatre, shown in the 1880s print below. 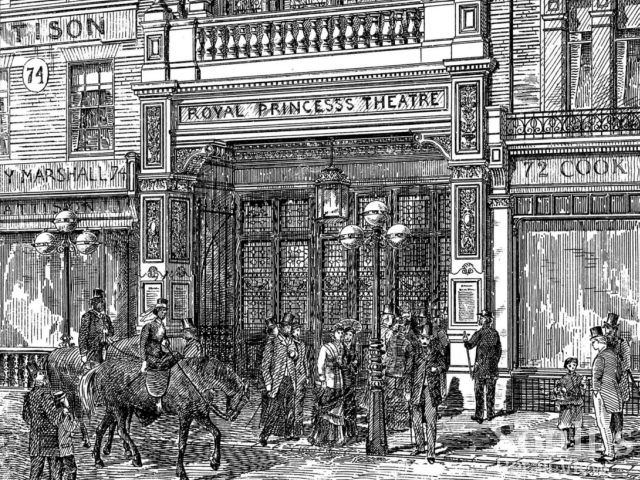 Interestingly, the building to the right of HMV that now houses the upmarket footwear retailer Aldo appears to be the same one as in the drawing above – compare the two and note the upper floor windows with their distinctive pilasters. 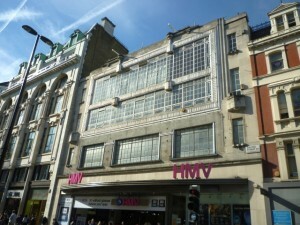 Following Woolies’ closure, I understand that the building became a shopping centre, called Oxford Walk, prior to HMV moving in later in the 1980s. 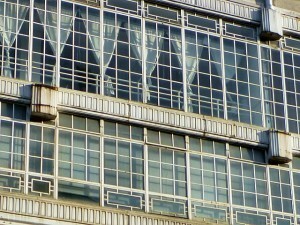 With its symmetry and lovely Art Deco detail by the architects Charles Ernest Elcock and Frederick Sutcliffe, the property retains some of the theatricality of the building that it replaced, and the second and third floor windows – spanning almost the full height and width of the façade – are particularly delightful. 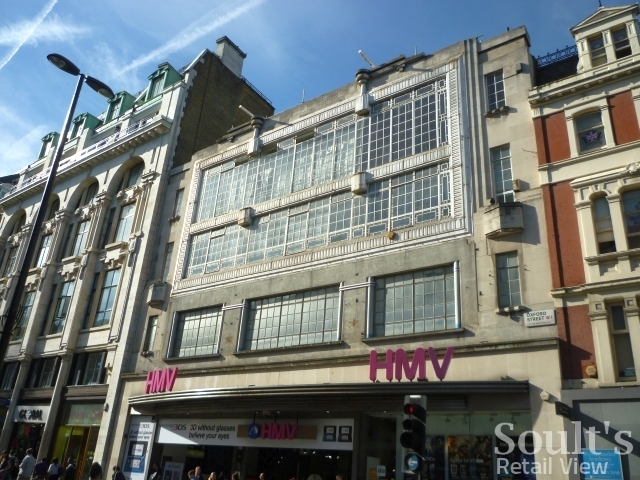 To be honest, the frontage could use some TLC, and hopefully this might be forthcoming as part of the ‘major refurbishment’ that’s planned for the store later this year – assuming, of course, that the increasingly beleaguered HMV manages to last that long. 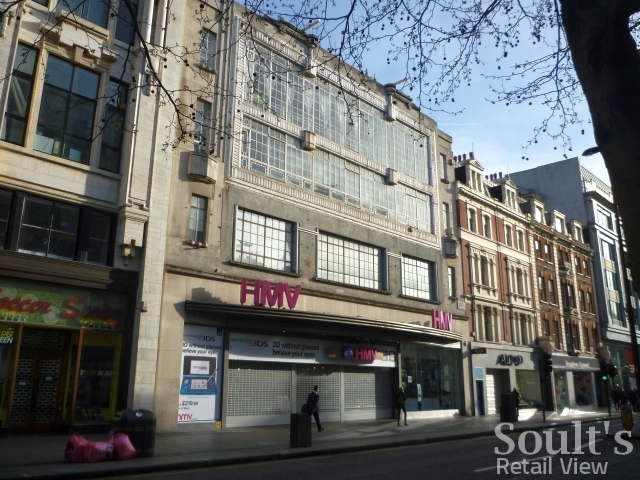 At the end of last year, HMV generated £13.7m from selling its nearby store at 360 Oxford Street to the American fashion retailer Forever 21, and has promised that at least some of this will be reinvested in improvements to other central London stores. 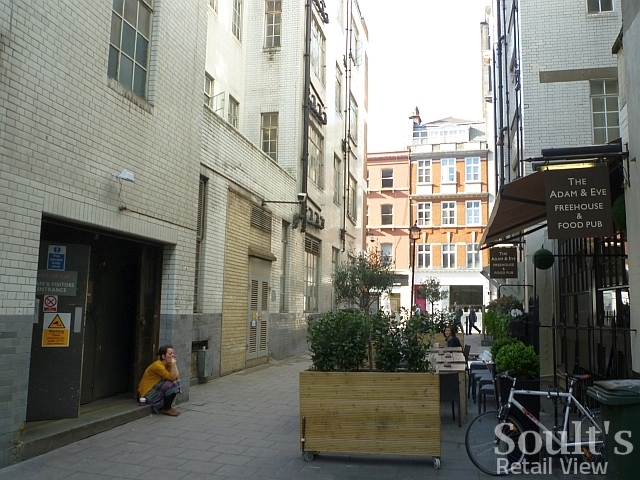 While on site, I also managed to locate the back entrance of the old Woolies, mentioned in an earlier Flickr discussion and situated in the appealingly named Adam & Eve Court. 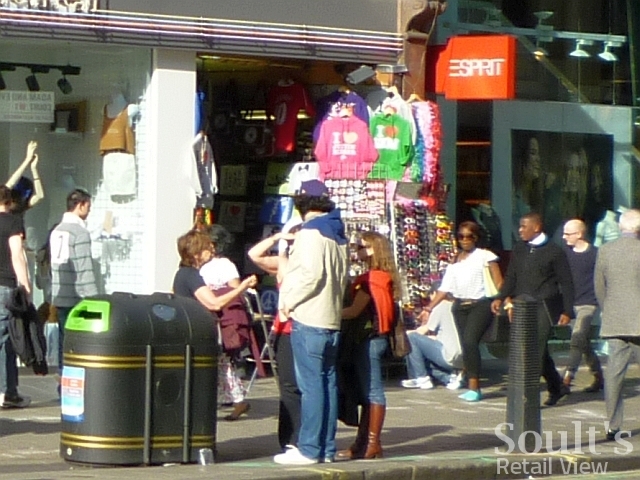 From Oxford Street, the Court is accessed via a narrow alleyway between American Apparel and Esprit – a couple of doors along from HMV – and is easy to miss behind the Oxford Street crowds and the clutter of a market stall. 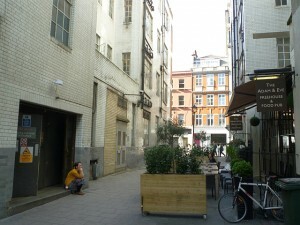 In fact, I did miss it at my first attempt, managing instead to locate the Court’s more prominent access from Eastcastle Street, the thoroughfare running parallel to Oxford Street at the back of HMV. Once in the Court, I was able to spot the old rear entrance to Woolworths – still used as HMV’s staff and visitor entrance – as well as a reincarnated version of the Adam & Eve tavern after which the street apparently took its name. 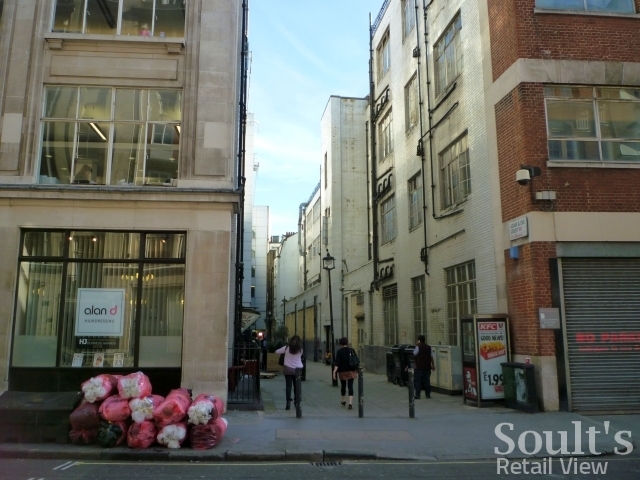 The fact that the HMV building must dogleg behind Aldo and American Apparel in order to have an entrance in Adam & Eve Court gives a sense of the property’s extent. For all that Oxford Street is the UK’s busiest shopping thoroughfare, I suspect that not many people have stopped to look up at the decorative detail of the former Woolworths building. 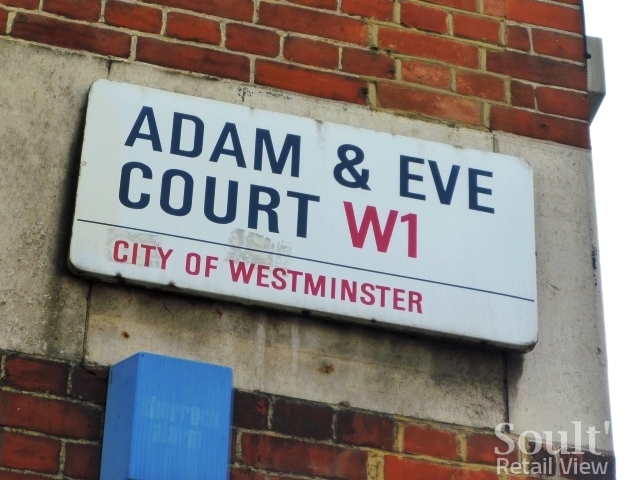 I’d imagine, however, that even fewer have ever ventured into Adam & Eve Court – a little oasis of calm from the bustle of Oxford Street, with a splash of Woolies history thrown in. Yes there was a restaurant, and a quick food outlet and a full bakery, I worked in them all , it was a fun place to work. (Les) the rear entrance detail needs to be updated. It would nice to hear from ex colleagues, get in touch? Did there used to be a restaurant in this Woolworths? I am sure my mum used to take me there when I was a child, to have fish and chips and seem to remember it being below ground level. Quite likely! Flagship stores of this kind almost always had a restaurant – sometimes up until the 1980s, I think. Thank you Graham. Thought I wasn’t imagining it! This is fantastic. Thank you so much for sharing this. My grandad and nanna met and worked along eastcastle street. My nan remembers watching the furniture being delivered to the store and picking out what she wanted to buy. She has passed away now so this is a lovely bit of history for us. and you thought you were documenting Woolies History. Inadvertently, you also documented the home of my ancestors as identified in the 1841 census. They and hoardes of neighbours are listed as living in adam and eve court! thanks for the pics, they are great. Another great piece of detective work! In 1986 I spent a few months working in the Wimpy restaurant, a few doors to the east of what was already HMV at that time. Wimpy’s backdoor was on the opposite side of Adam and Eve Court – I suspect quite a few of the shops shared a corridor onto the court for their back entrance. The Wimpy closed a few years later, after the company was taken over by Burger King. Don’t know what its used as today.